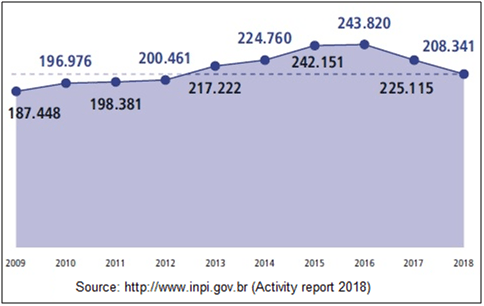 According to the 2018 Activity Report recently published by the Brazilian PTO (INPI), last year there was a productivity increase and a substantial reduction of processing time and backlog for trademarks and industrial designs. However, the backlog and the average examination time for patents still continues to be very high. The number of trademark filings rose moderately from 186,103 in 2017 to 204,419 in 2018, which represents an increase of 9.8% (Figure 1). Likewise, there was a significant increase in trademark registrations from 123,362 in 2017 to 191,813 in 2018 (55.5%). More importantly, the backlog was reduced from 358,776 by the end of 2017 to 191,535 by the end of 2018, which represents a decrease of 46.6%. According to the PTO´s report, the processing time from trademark filing was reduced from 48 months (in applications with opposition) and 24 months (in applications without opposition)in 2017 to 13 and 12 months in 2018, respectively. This substantial processing time reduction has been possible thanks to the INPI´s technical preparation to adhere to the Madrid Protocol in the near future. According to the INPI´s Strategic Plan 2018-2021, which was published in October 2018, the goal is to further reduce the processing time to 8 months in applications with opposition and to 4 months in applications without opposition. The 2018 Activity Report also shows a 63% reduction in the backlog of industrial designs, from 9,288 applications pending in December 2017 to 3,433 in December 2018. During the same period, there was a 40.3% increase in the number of industrial design registrations, from 6,220 to 8,725. In addition, there was a slight increase (1.9%) in the number of filings, rising from 6,000 in 2017 to 6,111 in 2018 (Figure 2). Since 2016 the INPI has been introducing several measures with the aim of tackling one of the biggest patent backlogs in the world, such as a 25% increase in its professional staff, including the recruitment of more than 200 new examiners, optimization of internal procedures, and improvements in the electronic systems. Moreover, the INPI has launched several Patent Prosecution Highway (PPH) programs since 2016 in order to expedite patent examination. Currently the INPI has running PPH programs with the United States Patent and Trademark Office (USPTO), the Japan Patent Office (JPO), as well as the Argentinian, Chilean, Colombian, Costa Rican, Paraguayan, Peruvian and Uruguayan Patent Offices, all of which are members of the IP Collaborative Project PROSUR. There are also PPH programs with the European Patent Office (EPO), the State Intellectual Property Office People’s Republic of China (SIPO), the United Kingdom Intellectual Property Office (UKIPO) and the Danish Patent and Trademark Office (DKPTO). As indicated in its 2018 Action Plan, the INPI further intends to enter into new PPH agreements with Russia (ROSPATENT), South Korea (KIPO), Israel (ILPO) and Mexico (INPI). However, despite these efforts, the 2018Activity Report continues to show worrying numbers. Even though there has been a high increase (77.5%) in patent grants, rising from 6,250 in 2017 to 11,090 in 2018, and the patent backlog has been reduced by 7.4% with respect to 2017, the year 2018 still closed with discouraging backlog statistics: 208,341 patent applications are still pending a first instance decision (Figure 3). As for patent filings, there has been a slight reduction from 28,667 in 2017 to 27,551 in 2018 (-3.9%). 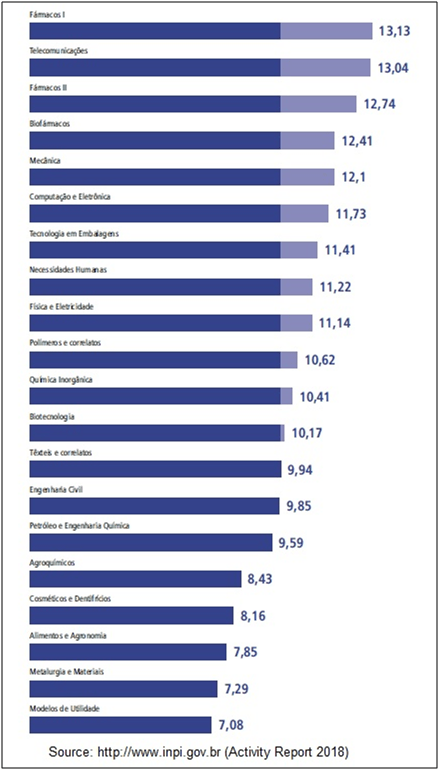 According to the 2018 Activity Report, the average decision time for patent applications in Brazil from filing is currently 10 years, with pharma and IT patent applications reaching a maximum average of 13 years (Figure 4). The INPI´s Strategic Plan 2018-2021 states that the goal is to reduce the average decision time to 5 years from the filing date. However, this document indicates that the achievement of this goal depends on the approval of the most radical and controversial measure aimed at addressing the patent backlog that the INPI has proposed: an automatic granting procedure of patent applications that were opened to public consultation in 2017. According to the proposal, if the procedure is enacted, a patent application (excluding pharmaceutical applications) filed or with the PCT’s national phase initiated up to the date of publication of the resolution and with examination requested, will be granted within 90 days without any substantive examination, after the issuance of a notice of admissibility in the simplified procedure, provided that third-party observations (pre-grant oppositions) have not been filed against said application. Applicants may request their patent applications to be excluded from the automatic granting procedure so it is subjected to the standard substantive examination. Nonetheless, at the time of writing this article, the automatic granting procedure, which was proposed by the INPI together with the former Ministry of Industry and Foreign Trade and Services (MDIC), has not yet been approved. 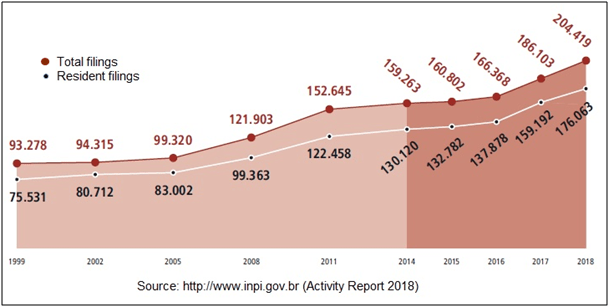 Moreover, since Brazil´s new president, Jair Bolsonaro, took office on January 1, 2019, the INPI no longer depends on the MDIC, but to the Special Secretariat for Productivity, Employment and Competitiveness of the newly created Ministry of Economy.